TENS Machines | Dynamic Physiotherapy & Sports Injury Clinic Inc.
TENS machines stands for transcutaneous electrical nerve stimulation. TENS are used as a pain relief device that is small, battery operated and portable. There are a wide variety of TENS machines available that are both functional and relatively inexpensive. TENS are connected to the area of stimulation by a minimum of two electrodes with the ability to modulate the pulse, frequency and intensity. It can be quite helpful in managing your pain. It is non invasive and is used for both acute and chronic type conditions. 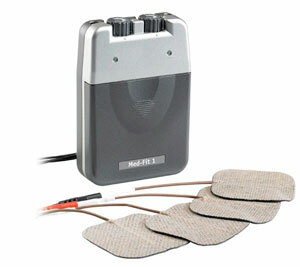 If you have any questions about TENS machine contact our staff at Dynamic Physiotherapy.